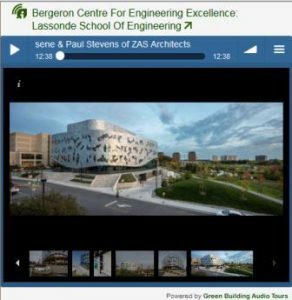 Take an audio tour with a slide show of York's newest green building, the Bergeron Centre for Engineering Excellence. Coffee cup waste: where does it go? Help to reduce coffee cup waste by recycling parts of your cup, or bring your own mug to eliminate waste and get a discount of up to 25¢ off of your coffee or tea purchase. Discover whats green at York University and get involved! York University announced on Tuesday, April 17 that as part of its ongoing commitment to sustainability, it will phase out the sale of bottled water on its Keele and Glendon campuses by September 2015. Find out what York students are doing this Earth Hour and hear their thoughts on the importance of sustainability..
York University rated greenest university in Canada and 14th worldwide by the GreenMetric World University Ranking. York University community members share what they do for the environment. For more ways to get involved, check out yorku.ca/sustainability.